Sarahah App Why Is Everyone Using It? Nowadays Sarahah App is very popular and free to use for on Android and iOS. Sarahah is an anonymous instant messaging app which allows his registered users to share the link to his friends and others. With the help of this link you can easily send anonymous messages to others. The main important thing of this app that you don’t have any way to know who is posted the messages. The Sarahah App is trending topic on different social networking websites like Facebook, Twitter etc. 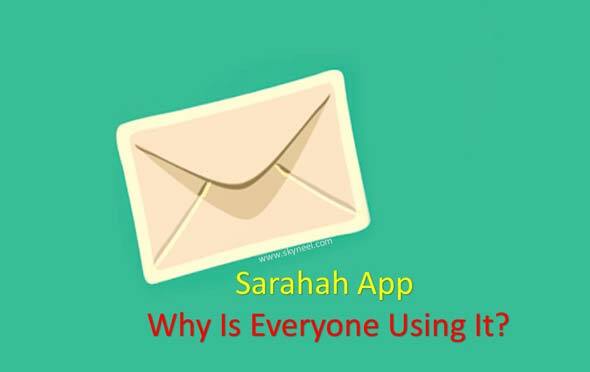 Lot of person don’t know about this app now in this article we have to discuss about What is Sarahah app and Why is everyone want to using it? Sarahah App is an anonymous messaging service. At this time Sarahah is top trending topic and number one free app which is available on App Store. Everyone discover information about this app and want to know who is sending the messages. Sarahah is an Arabic word which means honesty or candour or express your opinion without any fear. Sarahah App created by the Saudi Arabian developer Mr. Zain Al-Abidin Tawfiq to share honest thoughts anonymously. After register yourself they can given the link to your friends and other. Now, with the help of this link anyone can send them anonymous messages. There is no way how to check who is posted anonymous message. This app give a way to all those guys who want to share his opinion. They would not express his thought due to lost his job. Now with the help of Sarahah App they can easily express his ideas or views with others by sending anonymous messages. Must Read: How to get old look of Facebook account? This app too much popular within few months and as per report the above 10K users gives 5 star rating and lots of reviews on Google Play Store. This app gives a platform in which you can honestly share your views with others and your identity will be anonymous. Few person sent offensive messages using this app. Now company has added a tool which block all those users who are sending these type of messages.